[SatNews] Miranda Technologies, a Belden Brand, will use NAB 2014 to showcase its expanding range of solutions that help broadcasters navigate the path to IP-based workflows along with exciting new offerings in routing and monitoring. The new NVISION 8500 IP Gateway cards convert and packetize real-time, uncompressed, baseband video for distribution over Ethernet networks. The introduction of IP inputs and outputs to Miranda’s NV8500 routers represents a major step-forward in future-proofing and convenience for broadcasters as they look to transition from SDI to IP infrastructures. The hybrid-class (audio and video) cards run on any NVISION 8500 hybrid router and existing NVISION 8500 routers can be upgraded to support it. 10Gb Ethernet tie lines between core and production island routers can be easily established to allow a straightforward migration to high speed networking for mission critical data and content transport. Once SDI signals are packetized, they can easily be distributed rack-to-rack, truck-to-truck, between floors of a facility or even between buildings or campuses, over IP networks. The new NVISION CR6464 router is the latest addition to Miranda’s compact router range. In only 2RU, the CR6464 packages extreme density with reliability by virtue of high density DIN coaxial connectors, easily serviced hot-swappable crosspoints control card, IO cards, and a dual fan cooling module. Consistent with the CR range, the CR6464 handles all core formats including triple rate 3Gbps/HD/SD/ASI, and AES. It includes a built-in controller and the 64 x 64 matrixes fit nicely into space-constrained applications that need to manage more signals than ever before. Miranda further extends its IP-enabling portfolio with the IRG-3401 IP Gateway, a high density, bidirectional DVB-ASI/IP gateway that facilitates multiple applications for broadcasters. The card, which fits in Miranda’s Densité 3 chassis, is the densest IP gateway available, handling up to 120 gateways in a single 3RU frame. IRG-3401 has thousands of potential applications, and includes IP jitter removal, a vital quality of service factor in network performance. IRG-3401 supports UDP and RTP unicast or multicast streaming with Forward Error Correction and includes SFP Ethernet ports for electrical or optical connectivity. Miranda adds to its industry leading Densité range of signal processing solutions with several product introductions and upgrades at NAB 2014. LNS-3910 3G/HD/SD line synchronizer provides a clean output on video input hot switches within a 10-line buffer. The new SME-1911 streaming media encoder is the sister to the recently introduced SME-1901, offering the encoding without the distribution amplification available in the SME-1901. In addition, Miranda is introducing Version 3.0 of its line of processors that now support the latest loudness measurement standard ITU BS.1770-3 and ATSC and EBU recommended practices. The AMX, ADX, EAP and FRS processors now include Miranda Automatic Loudness Control with True-Peak limiters and handle up to 8 audio programs. 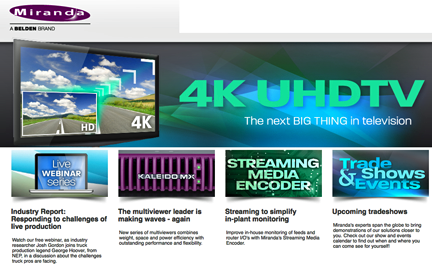 Kaleido IP X310: This new version of the Kaleido-IP multiviewer extends the level of monitoring support in this platform to 128 SD or 64 HD programs, the highest density in the industry. Kaleido IP X310 features double the number of simultaneous audio and video decodes as the previous Kaleido IP X300, and, at 1RU, it’s half the size — while maintaining the utmost quality in program monitoring. The Kaleido IP X310 comes standard with 4 GigE ports and is ideal for high-performance applications such as high-bandwidth H.264 HD video streams. iControl 6.0: Miranda’s iControl content monitoring and control platform has been further strengthened in Version 6.0 with a range of new control tools, an enhanced alarm panel, a simpler, easier-to-launch administration web interface, heightened security and extensive channel playlist and playout control. iControl 6.0 now enables the user to perform a simultaneous upgrade to all Densité’ modular cards. Individual cards can be safely tested before applying an upgrade to an entire facility. Whether tested individually or applied to an entire system, modular upgrades via iControl 6.0 can be performed swiftly and safely with no loss of communication with the Densité frame. EdgeVision 1.30: Substantial enhancements to Miranda’s EdgeVision Quality of Experience (QoE) monitoring system will also be featured at NAB. EdgeVision 1.30 now includes fingerprint generation to enable EdgeVision to be used in lip-sync and content mismatch detection applications. Its dynamic IP allocation means that EdgeVision automatically acquires its IP address from a facility’s DHCP server, eliminating the need for painstaking manual configuration. EdgeVision 1.30 also offers more precise streaming configuration parameters for the outgoing streams generated, which gives the user much greater control over network bandwidth usage. Access http://www.miranda.com/ for more information about Miranda's products.